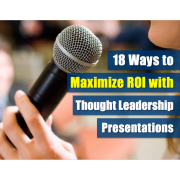 The first step to improving as a presenter is being aware of what you can improve on. Many good speakers want to become great presenters, but do not know where the differences lie. Even seasoned presenters may not realize they sway, use crutch words like “so” or “like”, or talk too fast. Your team may see these obstacles, but are timid to tell you, are used to them now, or do not realize they are a problem. You determine where you’re at and where to go with presenter assessments. Mechanics – Physical delivery of the presentation including voice projection, body movements, pace, and use of pauses. Visual Aid – Use of aids such as Powerpoint, videos, and props for ideal usage and placement. Content – Meat of the presentation including use of stories, authenticity, and effectiveness. Organization – Presentation’s flow, if breaks are utilized well and that the presentation stays on topic. Language – Explanation of terminology so the audience understands the entire presentation. Audience – Presenter’s engagement with the audience. Use of Crutch Words – Use of unnecessary words that interrupt the flow of the presentation. Presenter Assessments – Evaluate your presentation skills and give you a score out of 250 to measure yourself or your presentation team. This assessment can be done multiple times to evaluate how presenters grow and improve upon their skills. Presenter Assessments & Recommendations – In addition to the assessment, provide recommendations to improve presentation skills to become stronger, more engaging presenters. 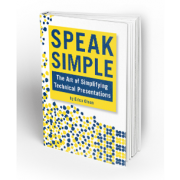 Both of these options are great tools for seasoned presenters and presentation teams, and Speak Simple’s presenter assessments are crafted for technical presenters in engineering, technology, construction, and marketing fields.